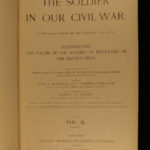 ‘The Soldier in our Civil War’ is one of the leading sources on the American Civil War, particularly those that are illustrated. This work, edited by Paul Mottelay, features hundreds of articles and essays which are supplemented by illustrations, portraits, and photographs depicting the Union and Confederate soldiers – showing his life, military surroundings, and his work as a soldier. This impressive two-volume set features the art and sketches of artists such as Forbes, Ward, Beard, Becker, Lovie, Schell, and many other first-hand witnesses to the details of the war.